Explore the most colorful reefs of the world together with us on the Pindito liveaboard! West Papua, known locally as Irian Jaya, is a unique dive region. Probably the best known archipelago is “Raja Ampat” which roughly means “united kingdom.” The area has over 1,500 islands. The four main islands are Misool, Salawati, Batanta and Waigeo. The territory within the islands of the Four Kings is enormous, covering 9.8 million acres of land and sea, home to 540 types of corals, more than 1,000 types of coral fish and 700 types of mollusks. This makes it the most diverse living library for world’s coral reef and underwater life. 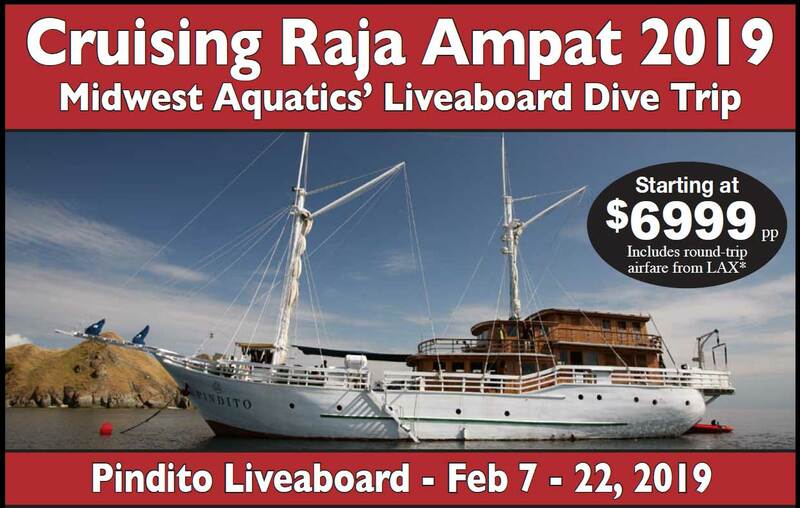 The MV Pindito is the only liveaboard dive boat operating in Raja Ampat with over 20 years of experience! The MV Pindito’s crew is unmatched for its diving knowledge and experience in Indonesia. Relax in the luxury of their teakwood-paneled cabins. Each 10’ x 10’ cabin is named after a mystical Indonesian island. The Pindito is 124’ long. Note: * Airfare subject to change until ticketed.